Add convenience, comfort and security to your home with a light and shade control system. Both artificial and natural light can be beautifully managed with controls programmed to your precise schedule. Light & Shade control adds so much value to your home. Give us a call to discuss the possibilities! 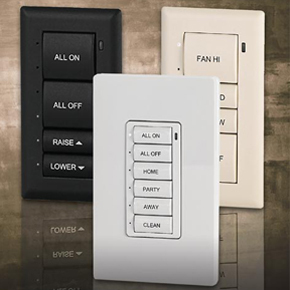 Best of all, there is a wide array of control device options: Touch Panels in various sizes, wall mounted keypads, hand held remotes…You can even use your smart phone or iPad™ to adjust your lights and shades! Save energy with programmed light and shade schedules: Exterior lights shut off after midnight. Lights in vacant rooms shut off when they are unoccupied. Shades, blinds and drapes automatically close at noon to keep the midday sun at bay. Minimize the wall clutter: We can combine your thermostat, light switch, security keypad and music control onto one device (there is even an app for your mobile device) that is really easy and convenient to use. Turn everything off when you leave: One button will turn off lights, setback the heat, turn of your TV’s and arm your security. light a pathway to the entrance. There have been significant advances in motorized drapes, shade and blinds for the control of natural light in the home. Be prepared for a great selection of attractive, environmentally concious fabrics for all window styles, and levels of privacy and insulation.